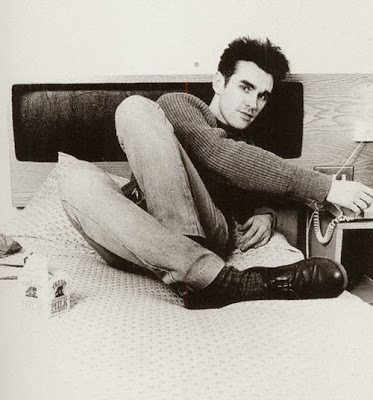 Here are all of the name-dropped songs and singles that furnish Morrissey’s Autobiography (excluding his own, of course) compiled as a playlist with all that Spotify will allow. Warning: it’s (predictably) quite brilliant…Here is the Spotify link: Morrissey: Autobiography playlist and the track listing is below. Treat yourself to my review of the Autobiography here. Francoise Hardy – All Over The World - English Version of "Dans Le Monde Entier"
Very impressed. I love a large percentage of this list. Some I didn't even remember! Wonderful, thank you for compiling! Thanks. This awesome. Some of the '60s stuff isn't doing it for me, but I love having this playlist. Just added it to my Spotify lists. Love the playlist, but I would like to say that Bernadette by the Four Tops is a rerecorded version from when the guys were a little older. It's still great but the original album version has much more feeling in my opinion, and I would assume this would be the version Morrissey would have originally heard. I only assume though, the book is not available here in the States as far as I know. Thanks again, what an awesome track listing and view into someones musical mind. Thanks everyone for your kind comments. Jeff, you're right, thanks for the heads up, I have replaced 'Bernadette' with the original single version.